I have always loved nature, animals, wildlife, etc., but I’m not so fond of the wildlife turning my expensive yard “flair” into their favorite menu item. Although we live in suburbia, we can see downtown Cleveland during certain seasons when there are little or no leaves on the trees in the ravine behind our house. Despite our close proximity to the city, deer are still regular visitors to our yard. We love our visitors except during incidents where, in a matter of minutes, they turned $100 worth of patio geraniums into an afternoon feast. I just talked about my extreme dislike for weeds, and if I could train my deer to eat only the weeds we would be in good shape, but that’s not likely to happen. On the bright side, I have discovered a wonderful deer and rabbit repellent. It’s called Liquid Fence and was developed by a retired chemical engineer after he moved to the Poconos and wanted to keep the deer out of his gardens. It’s all-natural, environmentally safe and smells like hell. Sincerely. It’s made of putrid eggs, garlic and water. When I spray it on the flowers, our daughter screams “Blech! Oh no, Mommy, you sprayed it again!” and makes a face similar to a cartoon character. But more importantly, it’s safe for flowers, fruits, vegetables – whatever you want to keep the animals from consuming – and it won’t absorb into the produce, so no worries. Your homegrown veggies won’t taste like rotten eggs! Yes, it smells awful when you’re spraying it, but as soon as it dries the smell disappears. I’m okay with the temporary smell because it’s safe, effective and it makes it less likely that my flowers disappear. This summer was the first year I haven’t used weed killer in my flower gardens. This change happened after a beloved friend of mine “took a tone” with me last year when I said I accidentally sprayed weed killer on my flowers because I wasn’t paying attention and thought it was my deer repellent. He said it was karma for using the weed killer! I’m not really a gardener and can’t say that I enjoy it that much. Although I would love a vegetable garden, our treed yard doesn’t really allow for it. I do, however, spend a lot of time outside with my kids and LOVE to have a pretty yard, with lots of flowers. My kids love to plant seeds, help me water (the flowers and each other) and watch the seeds eventually sprout to blooms. Problem is – weeds!… a cruel gift of that jokester, Mother Nature. I don’t know about you, but around here we have lots of annoying weeds that sprout up everywhere. They’ll even pop-up in cracks in the concrete. Those little helicopter-whirlygig seeds that come off the maple trees are driving me insane. Every single one of them has spawned its own tree in my flower gardens. Today, while weeding by hand, I stomped on one of those awful prickly weeds. It made me howl just like when I was a kid and stomped on them barefoot in the yard while playing. Weed killers made it so easy, however, the problem with weed killers is this — they contain Glyphosate, which is acutely toxic to humans and animals, carcinogenic, mutagenic, has been linked to reproductive defects and is harmful to the environment. I suppose that’s a pretty good reason for me to feel uncomfortable spraying them around my yard and fearing that my kids would come in contact with them. Add to that the guilt of those precious little toes running through a chemically fertilized lawn and I was a basket case! Needless to say, all of the above are off my list and out of my yard. Next time someone needs me, I’ll probably be knee-deep in weeds, but I’ll be chemical free! And by the way, although we never officially cancelled our service, and after months of not showing, we learned that our lawn care company (for fertilizing and weed killing!) went bankrupt over the winter, so I guess that was a “sign” and a little bit of karma too! Wouldya take a look at those giant breasts!!! We recently had occasion for a gathering at our house where we needed to cook for a large group of people and I knew the best option was to recruit my husband to handle some items on the grill. I considered the guests and their likes/dislikes and knew that chicken was an obvious, easy choice. 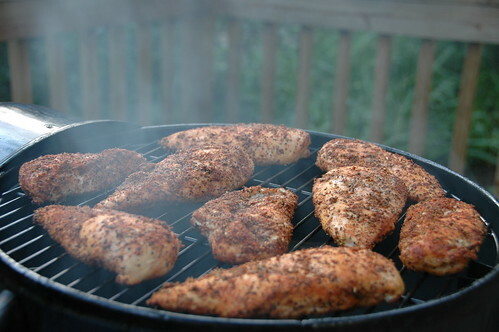 I didn’t open the packages until we were ready to grill, but when I did….my husband and I stood there… awestruck… mouths wide open at the ENORMITY of those chicken breasts! After being so used to the modest, NORMAL size of the organic chicken breasts I usually buy, we were shocked…SHOCKED! We have another gathering in a few days. Menu item: chicken. Needless to say, this time my wallet suffered a bit, but my conscience didn’t. Finally. A grocery store is taking responsibility. I recently shopped at a local, high-end chain grocery store. When I got home and looked at my receipt, the first line item read: Bagging credit: 3 @ $0.08 and in the cost column was a 24 cent credit. I realized that I had used three of my own reusable bags and the store was actually rewarding me for using them. Well, BRAVO! This is finally a step in the right direction. The credit isn’t going to amount to much, but that’s not my concern (especially considering my feelings about plastic bags). My concern is that they are taking responsibility and recognizing the importance of reducing the usage of plastic bags. I’m also not concerned if their motive is financial or simply an awareness of a growing issue. I simply applaud the progress. 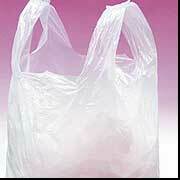 Plastic bags have already been outlawed in South Africa, Taiwan and Bangladesh. Six years ago Ireland actually imposed a 15 cent tax on every bag “sold” and I’m hopefully that we will soon follow suit*. I think if you charge people for every plastic bag taken, they’ll be forced to think long and hard before they accept six bags for 12 items! Okay….so another unfortunate by-product of my former “advertising life” is presentation, presentation, presentation! I have a difficult time accepting products that look like someone mixed it up in a bucket in their basement, poured it in a bottle and slapped a label on it. Unfortunately, perception is reality. In my heart, I want to accept the new green products that are hitting some shelves and especially online stores, but they’re difficult to embrace when they just don’t have that visual appeal. Is that shallow? I don’t know. Maybe a little bit, but when I’m slathering it all over my kids, washing their clothes in it and spraying it on a surface I know they’ll touch at LEAST 20 times a day, do I really want it to come from some scary-looking bottle with hokey-looking graphics and not a whole lot of explanation about what I just bought…AND slathered all over my kids, used to wash their clothes or sprayed on the surface that they ended up touching 40 TIMES that day?!?!? I guess that’s what we’re doing when we buy the old faithful stand-bys that we’ve believed we could trust for so long. “Mom used it and I’m okay, so it must be fine, right?” Unfortunately, wrong. I look forward to a day when those old stand-bys (full of toxic ingredients) get forced aside because we won’t accept them any longer. That day is coming, but many of the newer green products are already in bad need of a makeover so they give us a new sense of comfort about accepting a change.